The term “hurricane” is an official but arbitrary designation for a tropical storm that reaches sustained wind speeds of more than 75 miles per hour. Thus a single storm might pick up speed and become a “hurricane,” then lose speed and be downgraded to a “tropical storm,” then gain speed again and so on, several times in the course of it’s existence. Therefore, there is really no such thing as a “hurricane” distinct from other tropical storms of the same type. These strong tropical storms are quite common seasonally in the regions where they occur. They form along the equator, on both sides of it, and move toward the pole as they gain in strength. In modern times, forecasting when they will make landfall so inhabitants of low-lying coastal areas can evacuate has become the most important safety precaution available. Other protective measures include building codes that try to design structures to withstand the high winds, and insurance coverage to enable owners of damaged buildings to rebuild afterwards. Despite all efforts, however, nearly every year finds one or more hurricanes causing what the news media term a “natural disaster.” When this happens the cameras pan over the wreckage and the announcer’s voice describes the suffering of the “innocent victims” of “nature’s wrath.” The wisdom of millions of people choosing to live in a low-lying coastal area where hurricanes are known to be a frequent occurrence is never mentioned. It is taken for granted that cities and such large populations belong there and it is “nature” that is to blame if they suffer any damage. In the well-known case of New Orleans, the media constantly used the term “natural disaster.” Not many were asking if maybe it was not very smart to build a city of 2,000,000 people in a low-lying coastal area known to have frequent hurricanes. Most of them simply assumed New Orleans belonged there. More recently, in Haiti, many people were killed by mudslides caused by heavy rains. The heavy rains were inevitable in that climate. The mudslides, however, could have been avoided by not deforesting the hillsides uphill from where the people lived. The media called it a “natural disaster” and called the people “innocent victims,” but in fact they were not innocent; they had committed suicide by deforesting the hills above their villages. But as a direct result of these and other news stories reflecting the views of the media (and those who own the media) there has been a growing demand in recent years to “do something” about hurricanes. The people who are asking that “something be done” about hurricanes are not demanding that “something be done” about deforestation, or about the construction of large cities in coastal zones, or about allowing millions of people to live in those areas. Those factors are simply accepted as normal and inevitable, and the demand is to “do something” about the hurricanes instead. While at first glance it might seem not much could be done about such powerful storms, there have, in fact, been several suggestions along those lines. As long ago as the 1960s, the United States Air Force tried seeding hurricanes in the Caribbean in the hope that they could be induced to use up most of their water content before reaching land. This program was not successful. More recently other suggestions have been made, and one of them has been tried out by accident. The suggestion that a thin coating of oil on the waters of the ocean would retard evaporation sufficiently to prevent storms from growing is now being seen in action in the Gulf of Mexico as a result of an accidental oil spill. We shall soon see if this hypothesis has any merit. 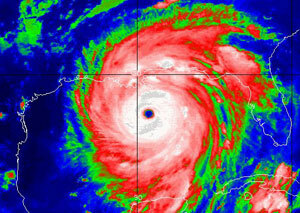 By whatever means, however, it would be a serious mistake to prevent or weaken hurricanes. They are a normal and necessary part of the global environment in which we live, and are essential to the functioning of the coastal ecosystems of the regions where they occur. Because they are regular, seasonal phenomena, hurricanes are a part of the expected annual series of weather events, and all species that live in a hurricane zone are adapted to their regular recurrence. They are, therefore, a part of the process that keeps the ecology in dynamic balance. Many species are dependent on them for creating the conditions they need. Hurricanes over water stir up bottom sediment, which provides extra nourishment to plankton, which are the base of the oceanic food chain, so for several weeks after a hurricane all aquatic life flourishes. Swift-churning waters break off small pieces of coral reefs, which are carried some distance away and sink to the bottom to grow into new reefs. This is one important way in which coral propagates, so without hurricanes the reefs would continue to grow in size, but could not spread to other areas to start new reefs. When a big tree falls, the gap in the canopy allows sunlight to reach a lot of seedlings and underbrush, which need sunlight to grow, and could not grow in the shade of the big tree. Many species in a forest community need these gaps and the sunlight they permit to fill their role in the forest ecosystem. While a big fallen tree is being recycled back into the forest floor to provide nutrients for a next generation of trees, it is also providing years of food and habitat for the insects and microbes that do the recycling. It also is providing habitat for many species of animal life that hide in the tangle of broken branches to protect them from predators. In areas where hurricanes are common, all native species are adapted to them. Non-native species in adjacent areas, which are not so adapted, therefore are kept out of the area by the recurring hurricanes. If the hurricanes stopped, they would be able to invade the former hurricane zone, to the detriment of the native species there, as all introduced species are always destructive to native species that are not adapted to them. In areas where hurricanes are common, a significant portion of the yearly water supply comes from them. Without hurricanes there would be a water shortfall amounting to a major drought. The water shortfall could not be made up by simply causing extraordinary rainstorms because the heavy downpour typical of hurricanes provides enough water all at once to flush out coastal ecosystems and rejuvenate them. Since this is an annual event, these coastal ecosystems are adapted to it and need it. Low-lying coastal areas in the tropics and subtropics are the richest, most diverse ecosystems on earth. Many such areas are under heavy threat from unrestricted development. Other areas are still relatively intact because the frequency of hurricanes discourages human occupation. If hurricanes were no longer a factor, these fragile coastal ecosystems would soon be overrun by development from which they are now protected by the fact that hurricanes are common there. From these few examples, it should be plain that a program to prevent hurricanes or weaken them to the point of any significant alteration of their major features would be a disastrous mistake. Yet there is an increasing chorus of voices demanding “something be done” about this important and much-needed phenomena and sooner or later “something” will be attempted. So now is the time for people who understand the necessity for hurricanes to begin to organize to protect them from those who in their ignorance would attempt to tamper with them. Instead of waiting until it is too late and a program of hurricane suppression is undertaken, a movement to protect our atmosphere from well-meaning but ignorant interference which could spell incalculable disaster should be begun now, while there is still time to gain strength before any serious damage is done to ability of the atmosphere to support the conditions upon which life depends.